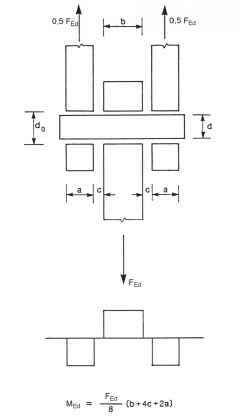 (1) The design resistance, ^j,Rd of a symmetric column base plate subject to an axial compressive force applied concentrically may be determined by adding together the individual design resistance -FC,Rd of the three T-stubs shown in Figure 6.19 (Two T-stubs under the column flanges and one T-stub under the column web.) The three T-stubs should not be overlapping, see Figure 6.19. The design resistance of each of these T-stubs should be calculated using the method given in 6.2.5.